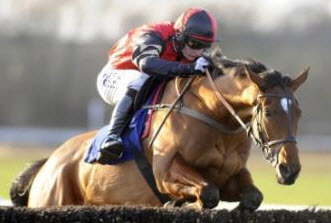 Harry The Viking, born on April 29, 2005, was just touched off on his debut by stable companion Oscargo in a three-mile maiden hurdle at Chepstow in March, 2011, but made no mistake back at the Welsh course in October, 2011, scoring decisively by two lengths from the classy Forgotten Gold. After overcoming greenness to win a novices’ hurdle at Towcester the following month, Harry The Viking got the better of Saint Are in a three-mile novices’ chase at Doncaster in December, 2011, before a game victory over Ikoroudu Road in a novices’ handicap chase at the same course later that month. Despite his relative inexperience, he lined up in the four-mile National Hunt Chase at the 2012 Cheltenham Festival and ran with plenty of credit to finish second to comfortable winner Teaforthree. On the back of that effort, Harry The Viking was sent off favourite for the Scottish Grand National at Ayr in April, 2012, but disappointed when pulled up before the 19th. The eight-year-old has failed to fire in three starts this season, being pulled up on his reappearance at Cheltenham in November and finishing down the field in the Hennessy Gold Cup at Newbury in December and the Fulke Walwyn Kim Muir Handicap Chase at the Cheltenham Festival on March 14. Sir Alex Ferguson is the manager of Manchester United Football Club and the most successful British football manager of all time. Born December 31, 1941 in Govan, Glasgow, Ferguson scored a consolation goal on his league debut as a player for Queen’s Park, aged 16. His playing career subsequently took in St Johnstone, Dunfermline, Rangers, Falkirk and Ayr United. His £65,000 transfer between Dunfermline and Rangers in 1967 was at the time a record fee between two Scottish clubs. After retiring from playing at the end of the 1973/74 season, he stepped into management with East Stirlingshire, followed by a successful spell at St Mirren, and then Aberdeen where he won the Scottish Premier Division three times and added the UEFA Cup Winner’s Cup. He was Scotland’s national team manager from September 1985 until June, 1986, leaving the post when the team was dumped out of the World Cup in Mexico with only one point from three matches. Ferguson became Manchester United manager that year and his phenomenal reign has seen the club land the Premier League title 12 times, the FA Cup on five occasions, the League Cup four times, a UEFA Cup Winners’ Cup, and the UEFA Champions’ League twice. He was made an OBE in 1983, received his CBE in 1995 and was knighted in 1999. Ferguson married Cathy in 1966 and they have three sons, Mark and the twins, Darren (a football manager) and Jason (a football agent). Ferguson has been a major financial donor to the Labour party and lives in Wilmslow, Cheshire. The best horse to carry his red colours was the great miler Rock Of Gibraltar, who notched a European record of seven consecutive Group One victories that included the 2001 renewals of the 2,000 Guineas, Sussex Stakes and Prix du Moulin. Ged Mason became chief executive of Morson Group in January, 2005, having been the company’s managing director from 1999. Mason, 49, joined the Morson Group in 1986 after completing his university education and following a period working for a technical recruitment company in Canada. Morson Group Plc is a leading provider of human capital and engineering design solutions to the engineering and technical business sectors. Mason’s colours are associated with dual Grade One winner What A Friend and Sporazene, who landed the Vincent O’Brien County Handicap Hurdle at the 2004 Cheltenham Festival, as well as a Punchestown Grade One in 2003. He first got into racing through his attendance as a guest at corporate events. Ron Wood, 64, started a wholesale greeting card and gift wrap business with his wife Gail in 1966 and sold the company, which became known as Birthdays, for £90 million in 1996. He has subsequently turned his attention to property and owns Ron Wood Developments, which is based in Bury. He lives in the village Greenmount on the outskirts of Manchester. Seven-time champion jump trainer Paul Nicholls was born at Lydney, Gloucestershire, April 17, 1962 and grew up in Olveston near Bristol. He has been training at Manor Farm Stables in Ditcheat, Somerset, since taking out a licence on November 1, 1991. The policeman’s son started out in racing as a jump jockey and partnered 119 winners between 1980 and 1989, with his biggest British successes coming in the Hennessy Gold Cup at Newbury on Broadheath (1986) and Playschool (1987), who also captured the 1988 Vincent O’Brien (Irish) Gold Cup with Paul up. He struggled to keep his weight down and gave up race riding. Between 1989 and 1991, he was assistant trainer to David Barons, who trained Boardheath and Playschool and sent out Seagram to win the 1991 Grand National at Aintree during that time. He has always trained at Paul Barber’s Manor Farm, initially with just eight horses. Nicholls, who now has over 200 horses in training, quickly made his mark as a trainer with an early highlight coming on Saturday, November 7, 1998, when pulling off the amazing feat of saddling seven winners and three seconds from 10 runners and he later made history when he became the first trainer to saddle six winners on the same card, at Wincanton, his local track, on January 21, 2006. Another early high point in his training career came at the 1999 Cheltenham Festival when he captured the major chase on each of the three days – Flagship Uberalles scored in the Racing Post Arkle Chase, Call Equiname in the Sportingbet Queen Mother Champion Chase the following day and, best of all, See More Business took the Betfred Cheltenham Gold Cup. Having strongly challenged Martin Pipe for the jump trainers’ championship over a number of years, most notably when pushing his great rival right to the last day of the 2004/05 campaign, Nicholls claimed his first title the following season and he has retained the title every season since, though he is in a fight for supremacy this season with Nicky Henderson. Recent flag-bearers for Nicholls have included the brilliant 16-time Grade One winner Kauto Star, who became the first horse to win the William Hill King George VI Chase five times and the only chaser to regain the Betfred Cheltenham Gold Cup at the Cheltenham Festival (2007 & 2009). Denman captured the 2008 Betfred Cheltenham Gold Cup and twice defied top weight to win the Hennessy Gold Cup, while Master Minded gained eight Grade One victories including two renewals of the Sportingbet Queen Mother Champion Chase. Big Buck’s has also entered the record books with 17 consecutive wins over hurdles, beating Sir Ken’s record of 16 set between 1951 and 1953, headed by an unprecedented four successive victories in the Ladbrokes World Hurdle. Nicholls celebrated a first victory in the Stan James Champion Hurdle with Rock On Ruby last year and he is currently fourth on the all time list of trainers at the Cheltenham Festival with 33 wins to his name. He became the first trainer to accrue more than £4 million in a season in 2007/08 and recorded his 2,000th winner at Down Royal on November 5, 2011, 20 years after taking out his training licence, making him the quickest to reach this landmark figure in jump racing. After saddling 52 runners in the John Smith’s Grand National, Nicholls finally recorded his first success in the great race in 2012 as Neptune Collonges beat Sunnyhillboy by a nose – the smallest winning margin in the history of the contest. John Smith’s Grand National Record: 1992 Just So (6th); 1996 Vicompt De Valmont (10th), Deep Bramble (PU bef 2 out), Brackenfield (UR 19th); 1997 Straight Talk (Fell 14th); 1998 What A Hand (Fell 1st), Court Melody (Fell 6th), General Crack (PU 11th); 1999 Strong Chairman (15th), Double Thriller (Fell 1st), 2000 Earthmover (Fell 4th), Torduff Express (Fell 13th), Flaked Oats (Fell 20th), Escartefigue (UR 30th); 2001 Earthmover (Fell 4th); 2002 Murt’s Man (PU bef 17th), Ad Hoc (BD 27th); 2003 Montifault (5th), Fadalko (UR 6th), Ad Hoc (UR 19th), Shotgun Willy (PU bef 22nd), Torduff Express (UR 27th); 2004 Exit To Wave (PU bef 9th); 2005 Royal Auclair (2nd), Heros Collonges (8th), L’Aventure (15th), Ad Hoc (Fell 22nd); 2006 Royal Auclair (Fell 1st), Le Roi Miguel (PU bef 19th), Cornish Rebel (PU bef 19th), Silver Birch (Fell 15th), Le Duc (UR 8th), Heros Collonges (UR 15th); 2007 Royal Auclair (Fell 9th), Le Duc (UR 6th), Eurotrek (PU bef 22nd), Thisthatandtother (PU bef 30th); 2008 Cornish Sett (12th), Mr Pointment (PU bef last), Turko (Fell 25th); 2009 My Will (3rd), Big Fella Thanks (6th), Cornish Sett (17th), Eurotrek (PU 17th); 2010 Big Fella Thanks (4th), Tricky Trickster (9th), My Will (Fell 4th), Nozic (UR 20th); 2011 Niche Market (5th), Ornais (Fell 4th), The Tother One (Fell 6th), What A Friend (PU 27th); 2012 NEPTUNE COLLONGES (WON).